This setting lets you receive consent from your end users for processing their data, thereby complying with GDPR. Navigate to “Manage >> General >> Support Center Settings” to view the “GDPR Preferences” at the end as shown below. Note: Any staff who has “Access Support Center Settings” permission can manage the GDPR settings. You can choose to include the consent in new ticket form and contact registration form by choosing the check box provided for each page. If this setting is enabled, HappyFox will enforce the contact to provide consent while registering on the support center, and each time while raising a support ticket. If you have setup more than one brand and wish to customise the consent text/links for each brand, navigate to “Multi Brand >> Customise >> Support Center Settings” and customise it as required. 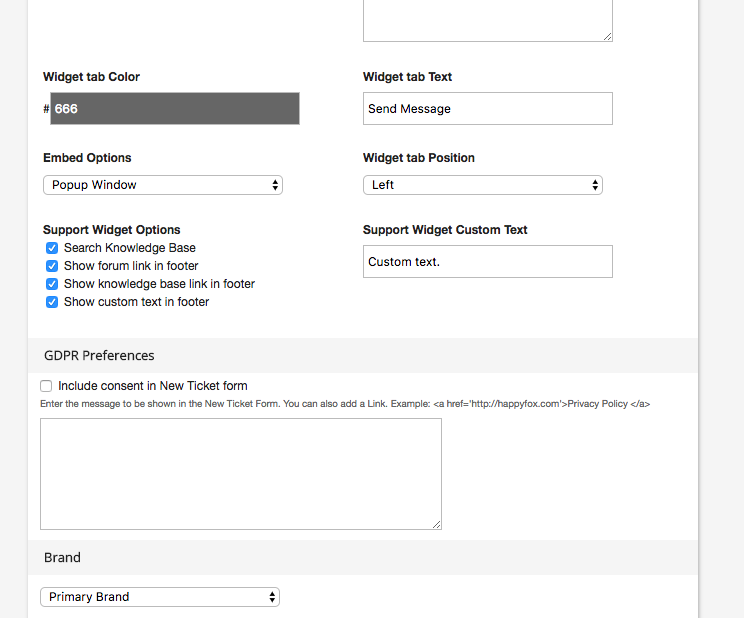 You can also collect consent from the support widget. To dothis, go to Manage >> Integrations >> Support Widget and click edit against the support widget..
How it appears to the contacts. 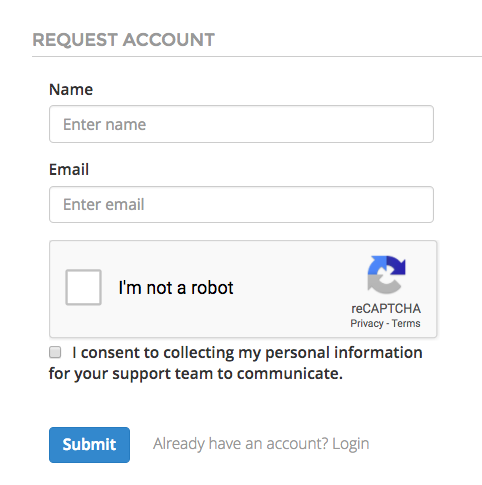 At the support center side, if the contact is trying to register an account, the consent gets displayed as shown below. 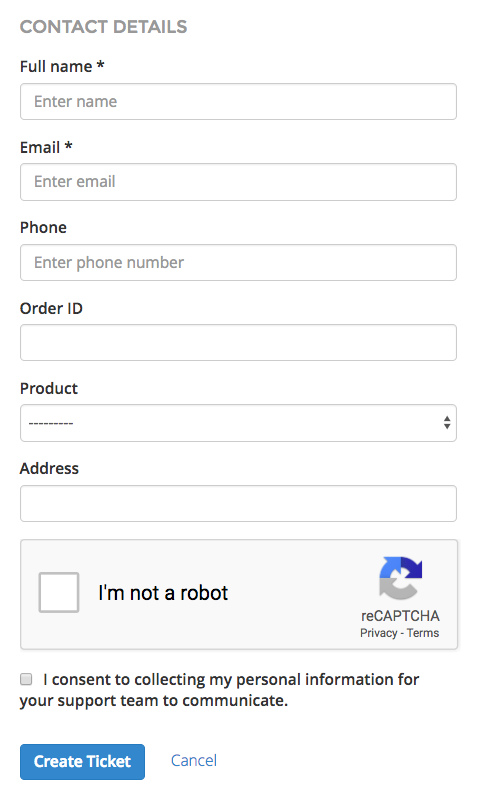 The contact will not be able to proceed with the registration without giving the consent. 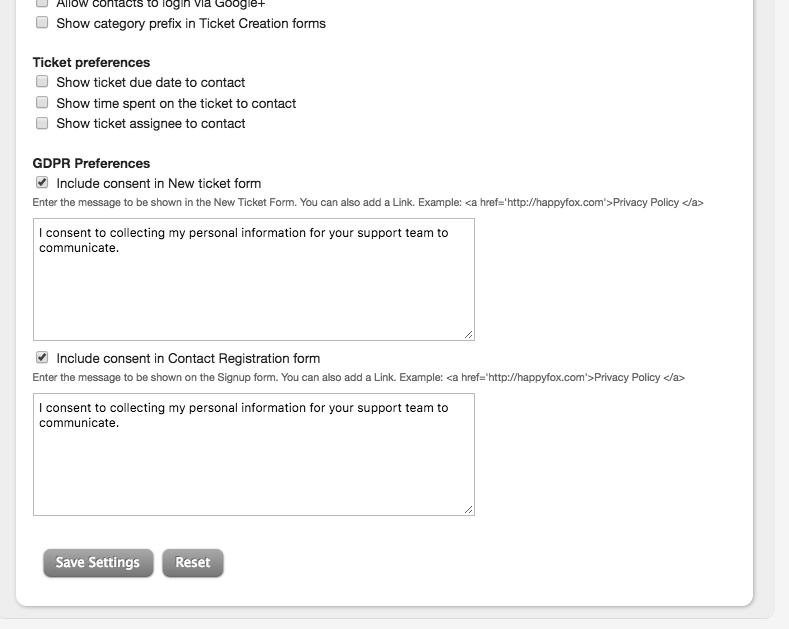 Similarly, when the contact tries to create a ticket via “Support Center” the consent will be collected in the bottom of the new ticket form as shown below. When the consent feature is enabled, staff can view more details on the consent action at contact level within the contact detail page. The “Recent GDPR Consent” section will include the date and time at which the contact has provided the consent at account creation and ticket creation process as shown below.